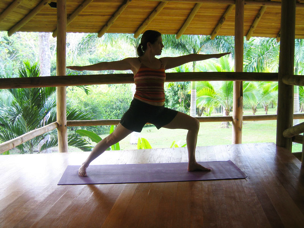 Bosque del Cabo has hosted many yoga groups for the past 17 years. We started hosting yoga groups about 16 years ago, right after we opened; we had the wonderful, kind, and well-known yogi David Swenson that brought groups to the lodge every February for many years. We also have hosted many years of yoga group sessions led by the wise and vivacious Jane Fryer and her Inward Bound workshops. 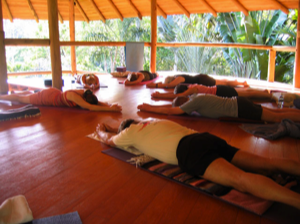 These days we prefer to host yoga groups during our Green Season (from May-November) and we have a wonderful facility called El Palenque in our Tropical Garden where the groups can practice. Palenque is a two-story open rancho building that has seen up to 25 people practicing on its beautiful upstairs hardwood floors. From the second story of the facility there is a great breeze and lush forest views in all directions; troops of monkeys have even been known to voice their raucous choruses during practice sessions, to the delight of the participants. Yoga groups at our lodge should be geared towards a remote, “unplugged” experience where participants will disconnect from phones, t.v,’s, internet, hair dyers and most of the outside world in order to find peace and harmony within themselves, and commune with fellow group participants and nature. Bosque does not offer air-conditioning, mirrored practice rooms, specialized meals, hot tubs or saunas. But it does offer tranquil landscapes, 700+ acres of trails and forest to explore, clean, sparking creeks & waterfalls, toucans calling from the trees, monkeys swinging through the forest, wholesome and freshly-prepared cuisine. 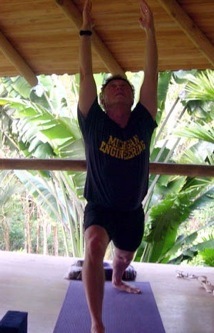 Please get in touch with us if you have any questions about past or future yoga groups at our lodge.